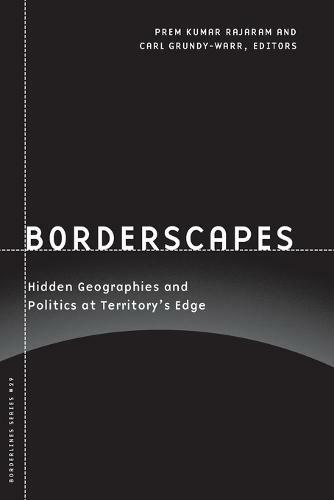 Connecting critical issues of state sovereignty with empirical concerns, Borderscapes interrogates the limits of political space. The essays in this volume analyze everyday procedures, such as the classifying of migrants and refugees, security in European and American detention centers, and the DNA sampling of migrants in Thailand, showing the border as a moral construct rich with panic, danger, and patriotism. Conceptualizing such places as immigration detention camps and refugee camps as areas of political contestation, this work forcefully argues that borders and migration are, ultimately, inextricable from questions of justice and its limits. Contributors: Didier Bigo, Institut d'etudes Politiques, Paris; Karin Dean; Elspeth Guild, U of Nijmegen; Emma Haddad; Alexander Horstmann, U of Munster; Alice M. Nah, National U of Singapore; Suvendrini Perera, Curtin U of Technology, Australia; James D. Sidaway, U of Plymouth, UK; Nevzat Soguk, U of Hawai"8i; Decha Tangseefa, Thammasat U, Bangkok; Mika Toyota, National U of Singapore. Prem Kumar Rajaram is assistant professor of sociology and social anthropology at the Central European University, Budapest, Hungary. Carl Grundy-Warr is senior lecturer of geography at the National University of Singapore.